You can count on a truly personalized experience when you visit Mt. Harrison Audiology. Our audiologists and team want your hearing aid experience to be optimized for your best hearing clarity, physical comfort, and cognitive function. That’s why we offer real-ear hearing aid fittings in Rupert, ID, at our 5-star-rated hearing center. Why Are Real-Ear Hearing Aid Fittings Important? Hearing aids are manufactured with an average degree of hearing loss taken into consideration and using standard settings when they leave the warehouse. While these standard settings may satisfy the needs of many hearing aid users, they do not take into account the personal hearing situation and individual ear acoustics of each patient. At Mt. Harrison Audiology, we offer personalized hearing aid services for our patients. When you visit our hearing aid center, we carefully evaluate your hearing condition and perform adjustments to fit your unique needs. We also perform a systematic program of probe-microphone testing and verification, where your optimal individualized settings can be established using our advanced technology. What’s Different About the Real-Ear Method? When audiologists receive hearing aids from the manufacturer, they are set with the average user in mind. When hearing aids are fit to patients, the factory setting is changed, but generally to a setting at the doctor’s discretion, with no real-ear testing taking place. At Mt. Harrison Audiology we take hearing aid fittings one step further. 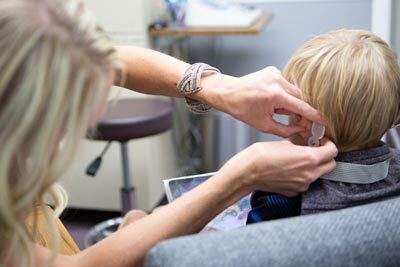 In using real-ear probe-microphone verification, our audiologists establish precise settings that are most beneficial to your unique hearing needs. Real-ear measurements also allow our audiologist to evaluate your hearing while you are actively wearing the device. First, our audiologist will measure the size and shape of your ear canal so that we know your personal acoustic parameters. Then, using a small microphone inserted in the ear canal, our audiologist will introduce a sound which will be detected by the microphone and compared to what the microphone senses without the hearing aid in place. From this comparison, our audiologist can determine the most useful software setting for your specific degree of hearing loss. Learn More About Real-Ear Hearing Aid Fittings in Rupert, ID, Today! To learn more about our real-ear hearing aid fittings, call our friendly office at 208.312.0957 or click here to schedule your complimentary Mt. Harrison Audiology Communication Consultation. Your new patient appointment includes a review of your medical history, an in-depth discussion of your hearing loss concerns and goals, and an explanation of our process at no cost to you. After your consultation, our experienced team will recommend further evaluation and testing, if necessary, and a treatment plan customized to your hearing needs. Contact us today – we can’t wait to help you enjoy the sounds of life!